Project Hosts is attending the HIMSS19 Conference in Orlando, Florida this week and exhibiting in Booth #421. HIMSS19 Global Conference & Exhibition is the leading health information and technology conference. Over 45,000 healthcare IT professionals will gather for education, innovation, and collaboration. HIMSS hosted its first conference in 1962 and attendance continues to grow as individuals are dedicated to transforming health through information and technology. The Opening Reception of HIMSS19 will take place Monday (Feb 11) evening at 5:00 pm. The Exhibition Hall opens at 10:00 am on Tuesday (Feb 12). Attendees can roam around the exhibition floor discovering how other companies are revolutionizing health. Project Hosts will be exhibiting in Booth #421 and we are looking forward to meeting with attendees to discuss our service offerings. 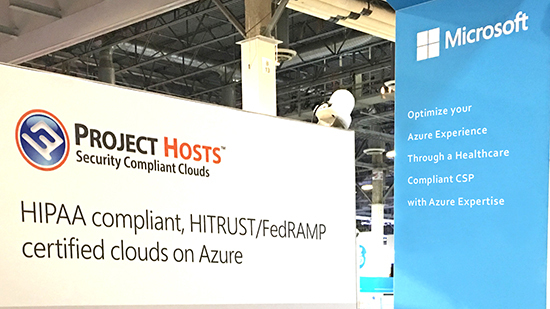 Project Hosts’ Azure Security Compliance Envelope enables Healthcare providers, payers, medical device companies and ISVs to move their on-premises apps and workloads into the cloud with full HIPAA compliance and HITRUST certification, quickly, cleanly and affordably. If customers wish to keep their subscription, we offer Azure managed services for customer’s subscription. With more than 14 years of experience, our team will provide comprehensive Azure Managed services, fully implement security controls, and provide 24×7 monitoring. Project Hosts offers an ISV Healthcare Program. Through Project Hosts, ISVs gain information security regulations standard compliance for their applications, while also gaining access to Azure experts who can architect, build, scale and provide advanced DRaaS (Disaster as a Service, backup and archiving) for their SaaS (Software as a Service) solution. Project Hosts is offering a free online HIPAA Healthcare Cloud gap assessment that will shine light on your cloud security practices.